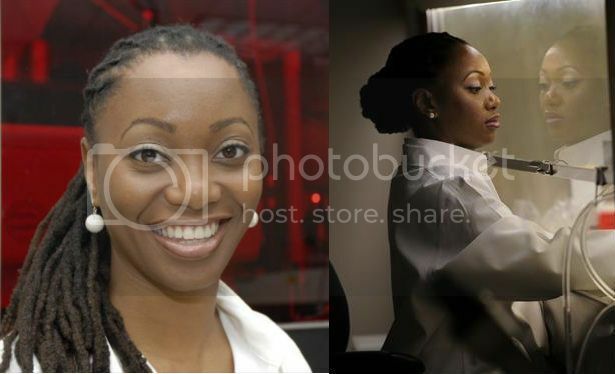 Dr. Hadiyah Nicole Green is one of less than a hundred Black women physicists in the United States. With her accomplishment, she's embraced a particular responsibility not only to her profession but to the underrepresented communities of which she's a part. She told AL.com, "It takes a village to raise a child," she said. "I repeat that because a village of people helped raise me and instill values in me, and encouraged me to get to this point. I did not get here by myself. Because of that clarity, I know my responsibility to encourage and mentor the next generation." Dr. Green is assistant professor of physics at Tuskegee University, the HBCU founded by Booker T. Washington, and she received her undergraduate degree from Alabama A&M University. Right now she's working on a new way to fight cancer. As an alternative to chemotherapy, Green's technique has a cancer patient injected with a drug that contains nanoparticles. This will cause the patient's tumor to glow and a laser will be used to heat up the nanoparticles. The goal is a cancer treatment that is less expensive with fewer side effects. "Because of their need to work together and their inability to work apart, I can insure that the treatment is only happening to the cancer cells we target and identify," she told AL.com..
“The broader impact (on the community) of this research may include shorter treatment times, cheaper costs, and decreased side effects, leading to improved patient prognosis, quality of life, and life span for many cancer patients,” Green told WSFA. "Most current treatments do not result in 100 percent elimination of a tumor after one treatment or even after several treatments that can last for hours over the course of months," she added. She began the work as a master's student at University of Alabama at Birmingham and continued while pursuing her Ph.D. In November, Tuskegee was awarded a $1.1M grant to continue Dr. Green's research.